The editors assume no liability for unsolicited manuscripts, photos and illustrations submitted. If you are interested in sharing content or in sponsorships at WiWi-Online, get in touch by telephone, fax or e-mail. WiWi-Online continually checks and updates the information on its web site. Despite thorough checks certain data may have changed since posting on the site. The company can therefore not assume any liability or issue any guarantee for the information provided being current, correct or complete. The same applies to all other content and information to which a person might be directed by hyperlinks. WiWi-Online is not responsible for the content of the web pages reached via this type of link. WiWi-Online in addition reserves the right to make changes or amendments to the information provided. The content and structure of WiWi-Online's web sites is protected by copyright. No information or pictures may be reproduced without the prior written consent of WiWi-Online. This also applies to recording in electronic databases and reproduction on to CD or other media. Each natural person may only register with one e-mail address at WiWi-Online. 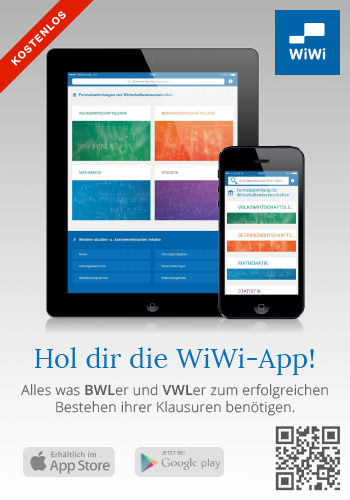 The data provided at WiWi-Online is intended only for private use. Commercial use requires the written permission of WiWi-Online. Any automated use of WiWi-Online, e.g. via offline browser, download manager, etc. is strictly prohibited. Non-compliance will be cause for criminal or civil prosecution. WiWi-Online takes the protection of personal data very seriously. The protection of your privacy is of the utmost importance to WiWi-Online. For this reason, compliance with legal data protection provisions is a matter of course for us. In addition, it is important for us that you always know when and what data we collect and how we use it. We would first like to explain what WiWi-Online understands by personal data. "Personal identifying information" is information that be used explicitly to determine your identity. This includes information such as your true name, address, postal address and telephone number. Information that is not directly associated with your true identity, e.g. preferred web pages or the number of users of a site, is not included here. Where is personal data collected? When registering for one of our personalised databases (e.g. the academic staff database) you will be asked for your first and family name and other personal information. We also request such information when you order a product. This information is stored on a specially protected server in Germany, where all information about your identity will only be collected by us if you expressly make it available to us. We do not share your personal information with third parties without first obtaining from you your express permission. We appreciate the trust you show in us and will use the utmost care in protecting your personal information. We would be happy receive any questions, suggestions or comments from you on the topic of data protection at the following e-mail address. Please note that the above terms and conditions are a translation of the binding German terms and conditions (Allgemeine Geschäftsbedingungen), and should therefore be used for information purposes only. For the complete text, kindly refer to the German version at www.wiwi-online.de. In case of dispute, however, only the German formulation shall be considered as valid. We regret any inconvenience that this may cause.